"The FIRST® Metal Screen là một phiên bản đặc biệt của The FIRST® với cùng cấu trúc cơ bản. Tuy nhiên, như tên gọi , đã có thêm một bề mặt kim loại chất lượng cao (*) dày đặc bao phủ tấm chắn Linear Structured Carbon® của nó. Như vậy The FIRST® Metal Screen có thể được xem như là phiên bản coaxial (unbalanced) "
The FIRST ® Metal Screen is an extension to our “The FIRST ®” series of coaxial Linear Structured Carbon ® (LSC) interconnects designed for highest quality audio and SPDIF digital signal transport. The FIRST ® Metal Screen is a special version of our The FIRST ® with the same basic construction, however, as its name already indicates, a dense braided high quality metal (*) screen covering its Linear Structured Carbon ® shield has been added. As such The FIRST ® Metal Screen can be looked upon as the coaxial (unbalanced) version of our The SECOND ® balanced Linear Structured Carbon ® interconnect which is also metal screened. *: High purity dense Silver coated high purity Matched Crystal OFC. Although both first mentioned 100% metal free versions perform hum and noise free in more than 95% of all line level interconnect applications, The FIRST ® Metal Screen with its lowest shield resistance has been specially designed for those situations where excessive ground currents flowing through the cable shield are present (e.g. with some tube equipment), in complex grounding situations and/or where extra shielding against strong external electrical interference is required (e.g. in highly electrical noise polluted areas). As an interconnect between (or to or from) tube equipment. For transport of weak signals such as from phono cartridges, microphones or musical instruments. As a long length interconnect. Unlike the other versions of our The FIRST ®, The FIRST ® Metal Screen (next to its below mentioned standard lengths) is also available in larger lengths (> 1.5 m.) on request. 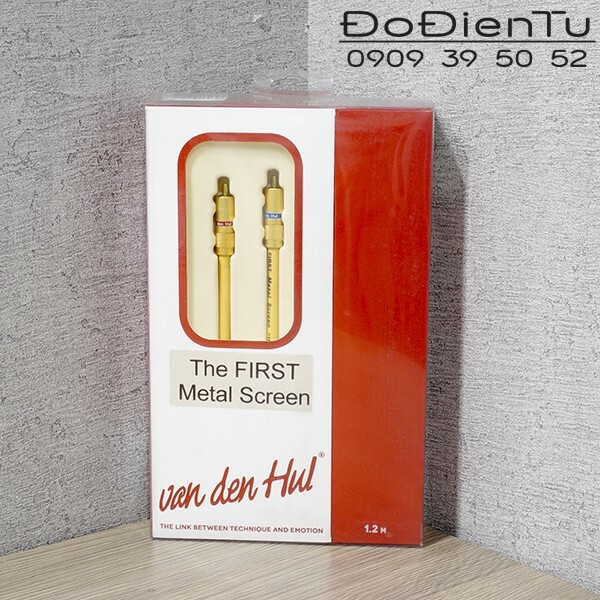 Regarding its excellent sonic characteristics The FIRST ® Metal Screen is very close our The FIRST ®. resistance Core: ~36 Ohm/m. ; Screen: 0.49 Ohm/100 m.
Our RCA type C - 8.0; Neutrik 1/4" (6.3 mm.) Jack/Phone plug; Custom mountable on ordered lengths. Single packed for SPDIF transport-dac purposes with RCA connectors in 0.6, 0.8, 1.0, 1.2 and 1.5 m. lengths. Other lengths are available on request. Connectors need to be factory mounted. (*): For MM and high output MC cartridges. Other types available in our “The FIRST ®” series: The FIRST ® Ultimate.